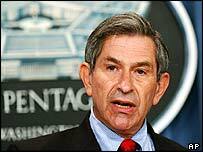 Deputy Defence Secretary Paul Wolfowitz: "I share your shock"
The Pentagon has abandoned plans to set up a controversial online trading market to help predict terrorist attacks. There was uproar after opposition Democrats in the US Senate highlighted the plan and described it as ridiculous and grotesque. Under the plan, bets could have been made about future terrorist attacks, conflicts, and assassination attempts. But the proposal ran into fierce opposition in the US Congress. Earlier, Senate Democratic leader Tom Daschle took to the Senate floor calling the proposal "a plan to trade in death". "This programme could provide an incentive actually to commit acts of terrorism," he declared. "It is perhaps the most irresponsible, outrageous and poorly thought out of anything I have heard from the administration." Ron Wyden of Oregon was one of two Democratic Senators who wrote to the Pentagon urging it to abandon the idea. "The idea of a federal betting parlour on atrocities and terrorism is ridiculous and it's grotesque," he said. His fellow Senator, Byron Dorgan of North Dakota, said he had trouble persuading people it was not a hoax. The idea was to improve the prediction and prevention of events by using the expertise of the open market instead of relying only on government agencies. "Research indicates that markets are extremely efficient, effective and timely aggregators of dispersed and even hidden information," said US Defence Department, defending the idea in a statement on Monday. The proposed scheme - called the Policy Analysis Market (Pam) - was set up by a Pentagon unit known as the Defence Advanced Research Projects Unit (Darpa). The BBC's Washington correspondent Nick Childs said the plan was a sign of the lengths defence and intelligence officials will go to find ways of preventing future events like the 11 September attacks. When confronted by outraged Democrats in Congress on Tuesday, Deputy Defence Secretary Paul Wolfowitz said he had learned about it from newspaper reports that morning. "I share your shock at this kind of programme," he told a foreign relations committee hearing. "We'll find out about it, but it is being terminated." However, he defended the work of the brains behind the project, Darpa. "The agency is brilliantly imaginative in places where we want them to be imaginative. It sounds like maybe they got too imaginative," he said. Invitations for an initial 1,000 traders had already gone out in preparation for an October start date. One of the organisations which provided data for the project was the Economist Intelligence Unit in London. Speaking before the plan was abandoned, its Director of Risk Services, Merli Baroudi, told BBC News Online: "It is trying to gather insights of people in a cost effective way. "Markets have done this in economics for some time and the Iowa Electronic Markets does it for US presidential elections, so it is not really novel." "It will be offencive to almost everyone"